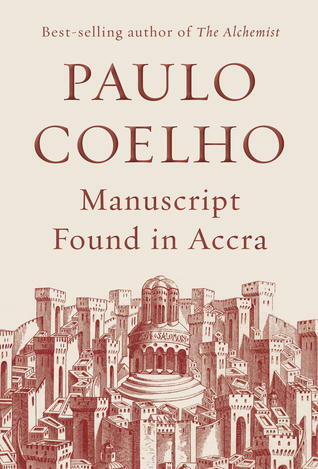 Manuscript Found in Accra is the latest novel from internationally known best-selling author Paulo Coelho. It is set in Jerusalem on July 14, 1099. A community of Christians, Arabs and Jews assemble to seek guidance of a Greek philosopher named Copt. He summoned the people of Jerusalem to ask questions as they await the invasion of crusaders. The townspeople have questions about fear, defeat, love, loyalty, success, faith and many more topics we experience as humans. The Copt answers the questions in a precise, beautiful way. Simple wisdom at its finest. Manuscript Found in Accra follows the tradition of The Alchemist and of Paulo Coelho's tweets. The parables are brief lessons full of wisdom and spiritual themes that will inspire readers and maybe spur a moment of reflection. It may be a short novel at less than 200 pages but it is meaningful and guaranteed to impact readers' lives. Manuscript Found in Accra has certainly made my Best Books of the year list. It is a book I will definitely re-read because the knowledge within applies to my everyday life and actually changed my perspective on a couple things. I'm glad I did not hesitate adding this book to my personal library for reading pleasure and as a life reference. If you thought The Alchemist was a life-changing book, then you will appreciate this profound read. Check out the video below of Paulo Coelho describing the book and how it is relevant to humans today. Then visit your local bookstore, library or digital book shop for a copy. Thank me later.